People have been getting a recharge through nourishment from our oceans since the very beginning of time. Seafood brings in a host of deliciously light flavours that are perfect for Fiji’s tropical climate. And what better way to enjoy seafood then to delve into a Surf and Turf platter for two, including delectable BBQ short ribs. Remarkably the perfect venue, with a sun deck overlooking Nadi Bay’s waterfront, The Wet Edge at Starwood’s Sheraton Denarau Villas, features a swim-up cocktails bar to enjoy this elegant platter. This relaxed and scenic venue is open from 11am to 9pm daily. Restaurant: The Wet Edge at Starwood’s Sheraton Denarau Villas. 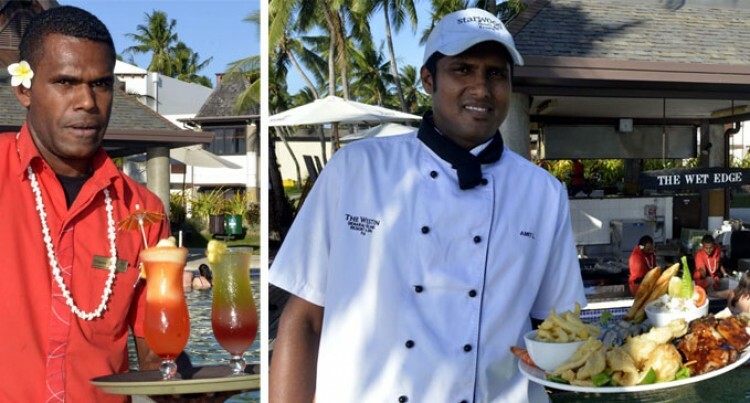 Experience: Mr Lal has been working with Starwood’s Sheraton and Westin resorts on Denarau Island for the past 10 years with rotation experience at various restaurant outlets from Ocean Terrace, Zing and Ports O’Call to his most recent five-year role at The Wet Edge. Background: Mr Lal completed a Diploma in Commercial Cookery in 2005. He is a three- time silver-medallist (2014, 2013, and 2012) in the Annual Moffat Chef’s culinary competition where over 300 local chefs participate. He also won the Starwood Fiji Complex – Employee of the Year Award in 2014 for his exemplary, outstanding performance. He draws his inspiration from Peter Kuruvita, an Australian celebrity chef and restaurateur, known for his rich culturally- inspired cooking, highly influenced by his Sri Lankan father and Austrian mother. Mr Kuruvita opened a signature Flying Fish Restaurant in partnership with Starwood Hotels in 2008. BBQ Pork Ribs 300 grams, Bay leaves 100g, Cinnamon sticks 3, Star anise 50g, Carrots 80g, Leak 50g, Celery 50g, Onion 1 chopped, Garlic 8 cloves, Fresh herbsparsley, Basil, Rosemary 1 cup, Salt/pepper to taste, BBQ sauce 1 cup. Slow simmer Pork Ribs with all ingredients for 2 hours until soft. Arrange the ribs in a single layer in a roasting pan. Cook the pork ribs for 15 minutes, turning occasionally and basting with any of the remaining marinade until golden and crisp. Writer suggestion: Surf and Turf Platter greatly complimented by a Flying Samo or Tropical Rainbow Cocktail mixed especially by barman, Viliame Varo. Bartender: Villiame Varo, 26, hails from Narewa Village, Nadi, and has been at The Wet Edge for four years. “A good bartender is one who is always ready to greet a guest and serve them with the utmost respect and professionalism whilst maintaining a cheerful and upbeat attitude,” Mr Varo said. “I always try to make our guests feel welcome by greeting with a big Bula smile and handshake. The same way I would make an old friend feel welcome at home. Come and savour refreshing swim-up cocktails at the Wet Edge Bar,” he added. Signature cocktails: Flying Samo – Vodka, Galliano, Grenadine, Fresh Pineapple, Passion fruit Juice. It is named after Fiji’s very own former Wallabies rep Radike Samo who scored the winning try against New Zealand in 2013.